Thai food is my go to for a quick and easy weeknight dinner. All you need is red curry paste, coconut milk, leftover veggies, and rice noodles and you’ve got yourself a delicious and hearty meal that cooks up in less than 15 minutes. But nothing, and I do mean nothing, comes close to the deliciousness that is Pad See Ew. 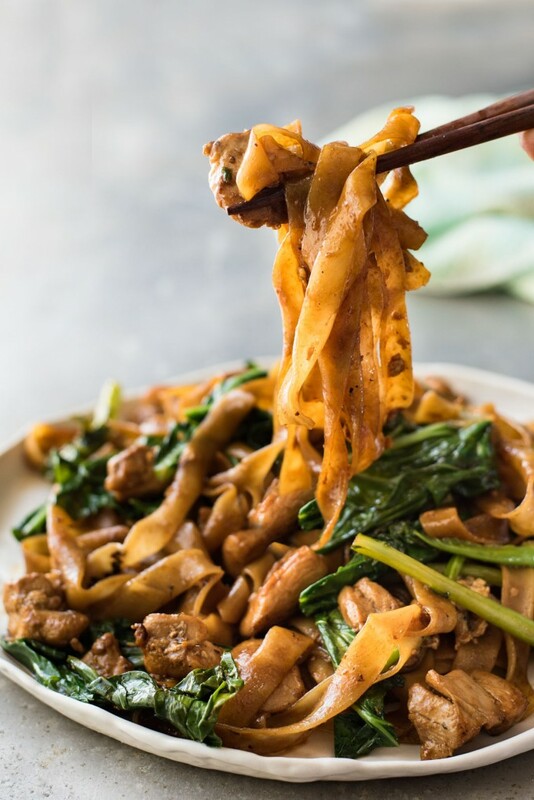 I’ve tried, in vain, for years to make Pad See Ew at home. 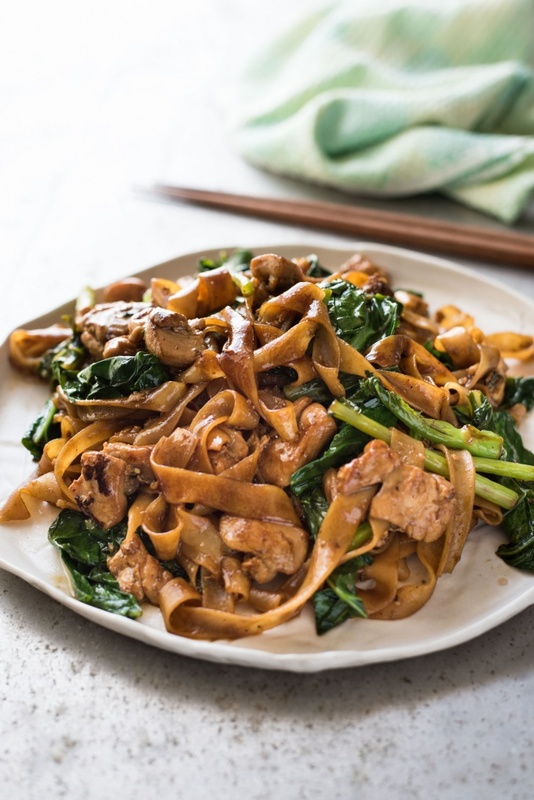 Real Pad See Ew has this unmistakable smoked flavor that comes from the oyster sauce the traditional recipe calls for. Alas, I’m a vegetarian, so I haven’t been able to really capture that flavor…until now. 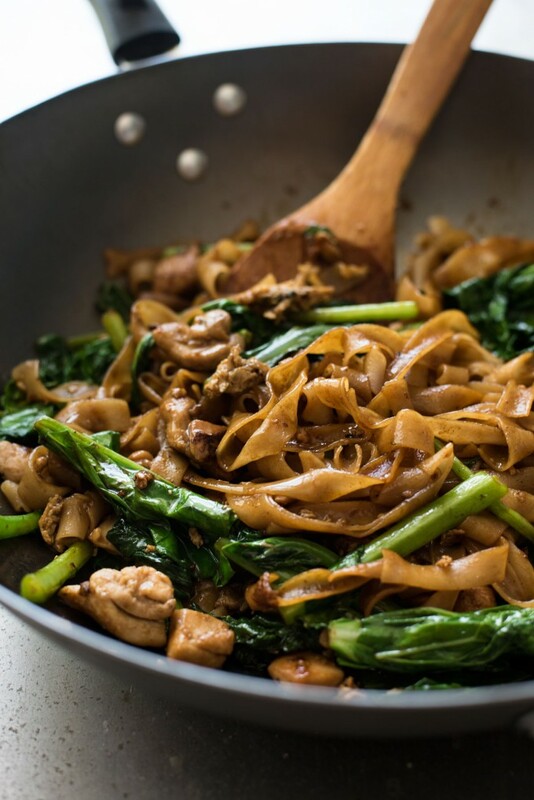 I think this may be the most perfect vegetarian Pad See Ew recipe I’ve ever tried. That, my friends, is what makes life beautiful. You must try this! Prepare the noodles according to packet instructions. Drain and set aside. Place cornflour in a large shallow dish. Season with salt and pepper. Heat oil in a wok over high heat. Toss tofu in cornflour until coated. Shake off excess. Shallow-fry tofu for 3 to 4 minutes or until golden and crisp. Remove with slotted spoon. Drain on paper towel. Discard oil. Meanwhile, in a bowl, combine sauce ingredients (soy sauce, oyster sauce, and brown sugar). Put vegetable oil in your wok. Mince the garlic straight into the wok with the oil. Place wok high heat. As the oil is heating, the garlic will gradually heat too and infuse the oil with flavor. When the oil is hot and the garlic is starting to turn golden, add the tofu and bok choy and stir fry for about 1 minute. Move the tofu and bok choy to one side and crack in the egg, and scramble it. Don’t worry if some of it sticks to the wok, it will char as you continue cooking – you want that char-grilled flavor! Combine the noodles, bok choy leaves, and the sauce. Fold gently to combine, for the sauce to coat the noodles evenly and to caramelize, and the leaves to just wilt. They only need to be just wilted because they will continue to cook while you are plating up. Just a couple of notes: Sometimes I just use whatever veggies I have on hand. Cook times for veggies vary, so just use your best judgment. Also, if you want the stalks of the bok choy to be more tender, you may want to separate the leaves from the stem and cook the stem a little bit longer before you add the tofu and separated leaves. This dish is all about the sauce though, so be creative with the ingredients!!! The above recipe is just a guideline…or my best estimate for the proportions I used when I prepared it. If it’s too sweet for you, add more soy sauce and oyster sauce. If it’s too salty, add more sugar. You’ll get the hang of it and believe me, it’s sooooo worth it! I’m so excited to be sharing this recipe with you guys! Maybe you haven’t had the pleasure of eating a Bánh Mì yet. 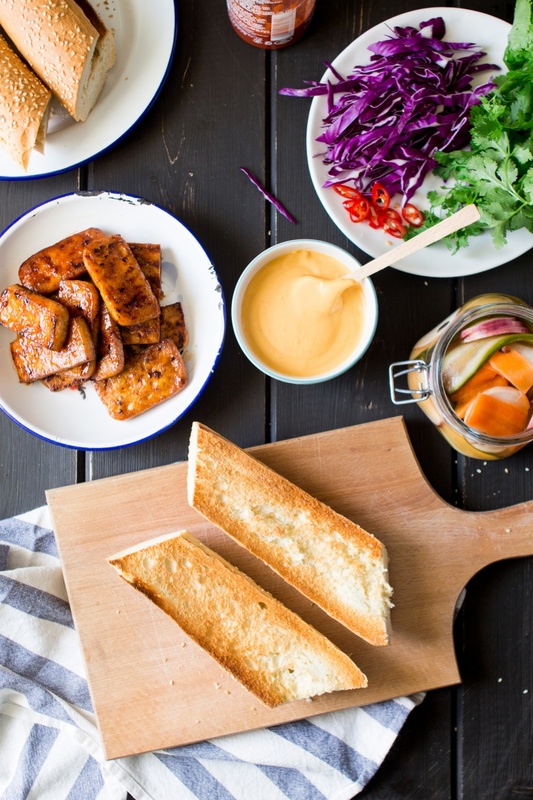 Maybe you’ve never heard of the deliciousness that is this Vietnamese sandwich. Maybe you’ve had the pulled pork version, but since you’ve gone vegetarian you’ve been denied of Bánh Mì glory. Either way, I have the perfect recipe to remedy your Bánh Mì woes. A while back I shared a tofu bacon, lettuce, and tomato sandwich recipe that, up until now, I thought was everything. I still love a good T-blt, but this bánh mì is giving me life! It’s a little bit spicy, a little bit crunchy, a little bit sweet, and a little bit crisp. It’s just perfect. After some experimentation with how I prepared the tofu, I’m pretty sure I’ve got the balance right. You soooooo need to try this! 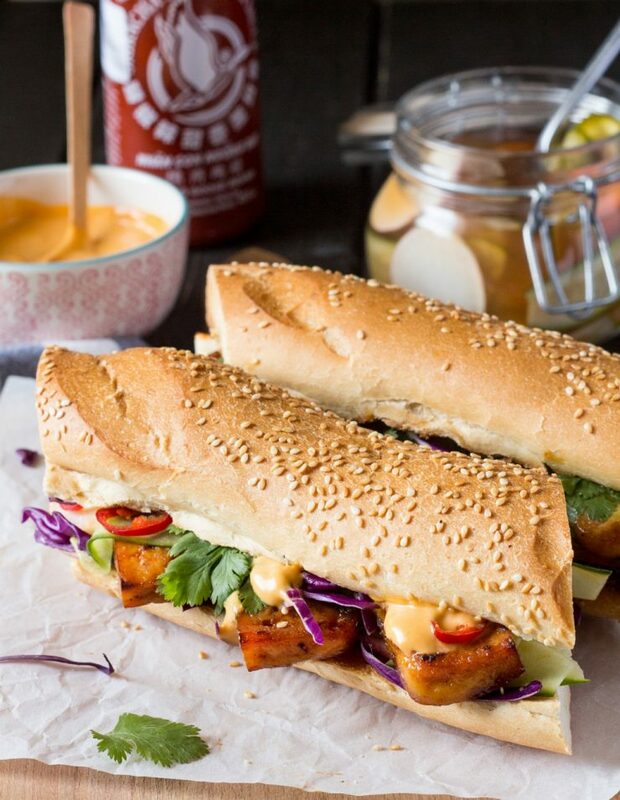 There are a lot of Bánh Mì recipes out there and each one I’ve seen forgets a crucial step that, to me, takes away from the overall texture of the tofu in the finished dish. I absolutely always freeze and then thaw the tofu before making my Bánh Mì. This step is crucial. Freezing and then thawing your tofu will change it’s texture making it easier to work with and making the marinade absorb better. Combine the shredded carrot, 2tbsp of the rice vinegar, 1 tbsp of the sugar, and a large pinch of salt in a mixing bowl. Cover and refrigerate. Slowly add in the soy sauce and then add the onion. Stir in the remaining 1 tablespoon rice vinegar and remove from the heat. Slice the baguette and remove some of the inner part of the bread.